Dollmaking is one of life's innocent joys. As the doll takes shape within your hands, there is no room in your mind for negative thoughts. Time slows down; the focus is on the creative magic taking place before you. 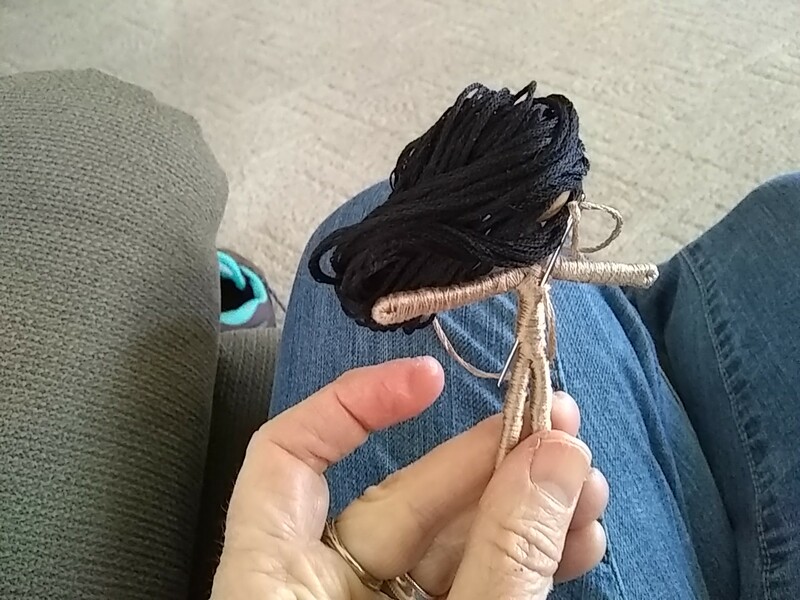 Whether you are crocheting, sewing, knitting, sculpting, or simply wrapping wire with floss, the doll is taking shape before your eyes, with a piece of your soul wound around it. These dolls are derived and inspired by a series of YouTube tutorials by Emilie Lefler. 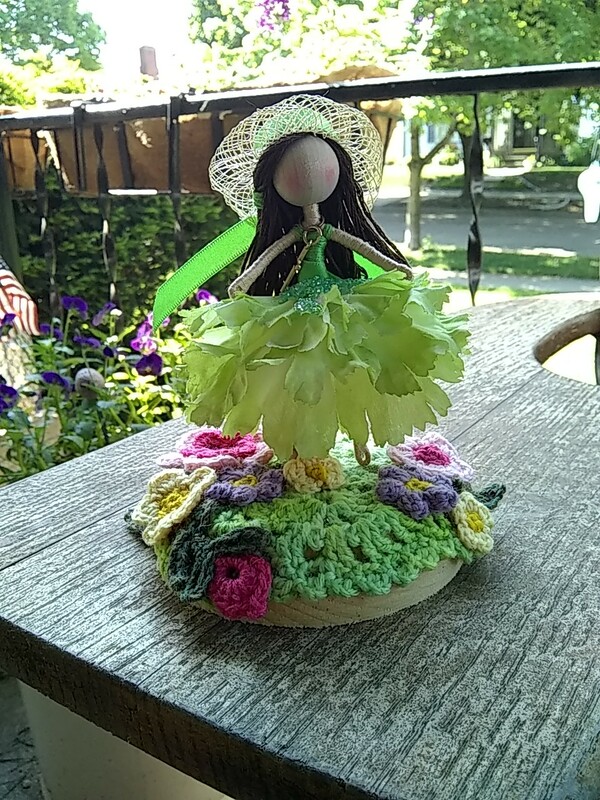 She has 60 tutorials, from 9 to 19 minutes in length, where she shows you how to create some truly beautiful dolls from bead, floral wire, floss, and flower petals. The first tutorial shows you how to make the basic doll. The only thing I do differently from Emilie when making the dolls is to wrap the end of the wire at the hands and feet, instead of securing with hot glue. In fact, I don't use any hot glue in the making of the doll body (a bit when doing the hair, though). 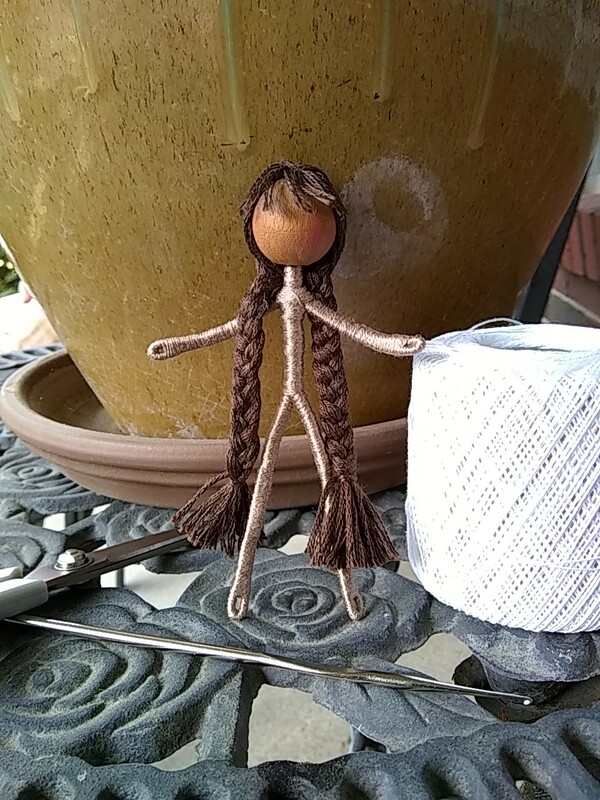 Instead, I bury the beginning of the floss when wrapping the doll, then at the end insert the floss tail into a tapestry needle and run it into the dolls body for an inch or sew and cut off, as in the image below. Also, my dolls are shorter, since I bend up the bottom of the leg about and inch or so to wrap all around the foot and then up the leg. 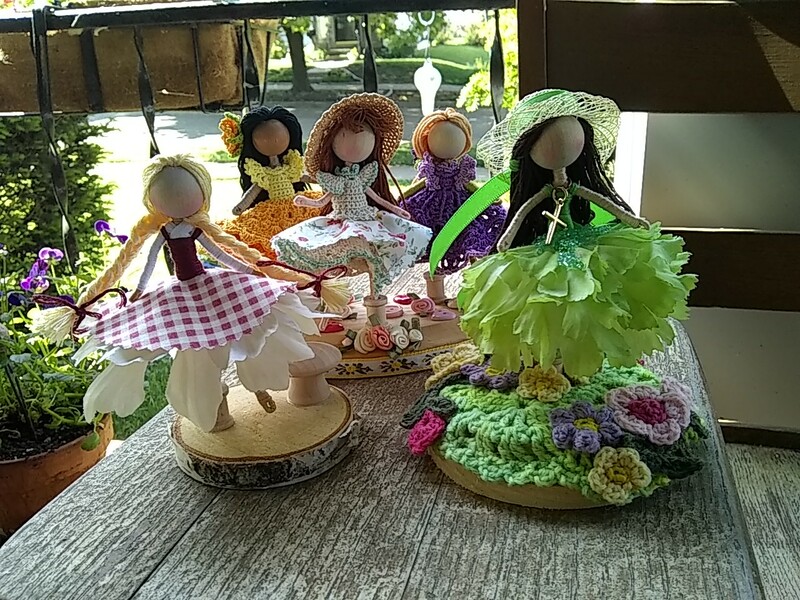 These lovely dolls are easy to make; I've used flower petals, fabric circles, and crochet to make their outfits. 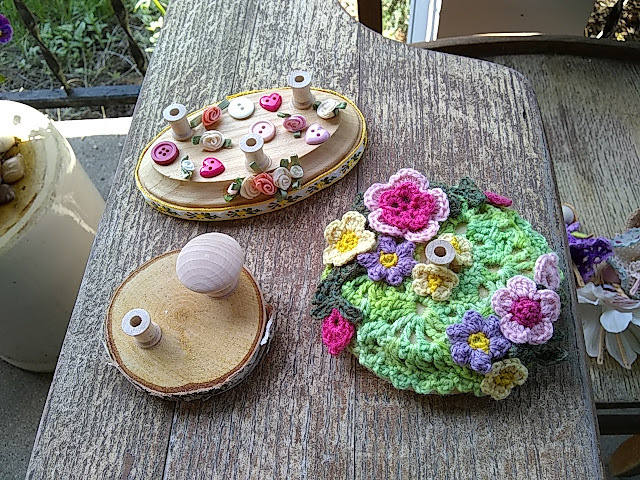 Some of them are remove-able (the crochet one's) others are not. 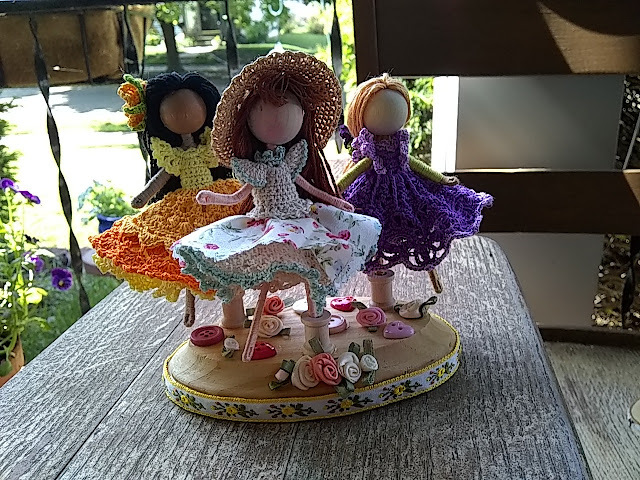 After each doll is complete there is such a feeling of sweet accomplishment and joy. Giving the dolls away shares this joy with others. 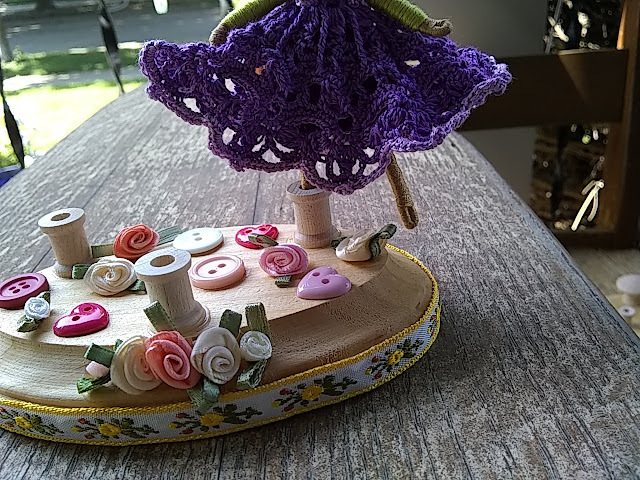 Here is a fun way to create a stand for your doll, which can be embellished or not to your heart's content. Using wood plaques or wooden disks or coasters, glue a small wooden spool to the disk. Make sure the hole in the spool is large enough to accommodate one foot of your doll. After the glue dries, decorate your stand as you like. The top one I just added buttons and ribbon roses randomly, the one on the left is a birch disk (from Michaels) with a wooden drawer knob masquerading as a mushroom, and the one on the right rather more elaborate with a crocheted doily and flowers glued down. Three dolls on one stand! 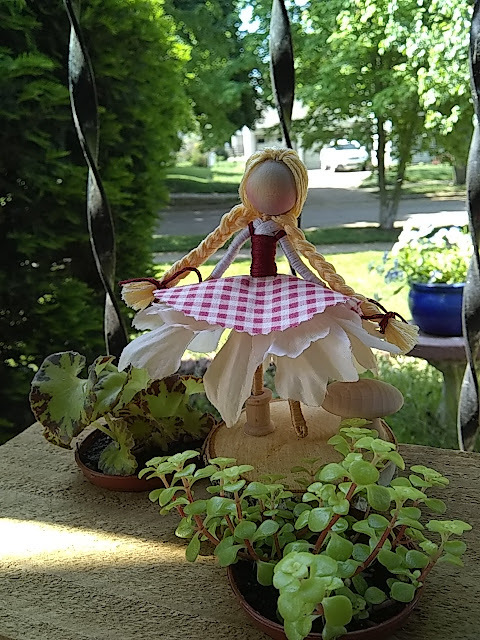 Create a space for joy and make a doll.